- Dunlop Trailmax TR91 tires. - Oversized floating front brake rotor. - Cast aluminum ribbed stator cover and front sprocket guard. - K&N air filter kit, aluminum battery box, air injection plugs, and rectifier relocator. - Recovered seat with RSD spec leather, featuring a hand-tooled hawk/triumph logo on the rear and RSD logo badges stitched into each side. - All bodywork, including the headlight bucket, have been painted by Airtrix with a two tone, satin titanium color combination and red pin-striping. The custom paint job features a Hawk logo on each side of the gas tank and flavorful Roland Sands Design lettering on the fenders. The tank is topped off with an RSD gas cap for good measure. - Oversized Renthal Fatbars and are attached with modified RSD risers. - Adjustable-reach billet Pazzo brake and clutch levers allow on-the-fly adjustment. - One-off Black Ops RSD tracker grips, wrapped in Renthal rubber, connect the rider to the machine with style and performance in mind. A sense of adventure from back in the day. A modern interpretation of a timeless classic, the Scrambler Tony Hawk Special demands attention wherever it goes. 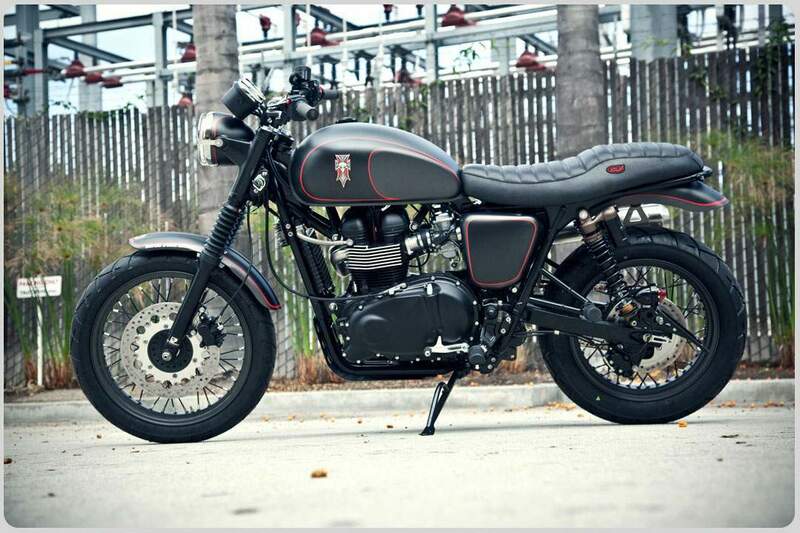 Triumph's legendary 865cc air-cooled parallel-twin engine with modern fuel injection and plenty of torque. The distinctive sound from the 270 degree firing order and the twin stainless steel upswept pipes. 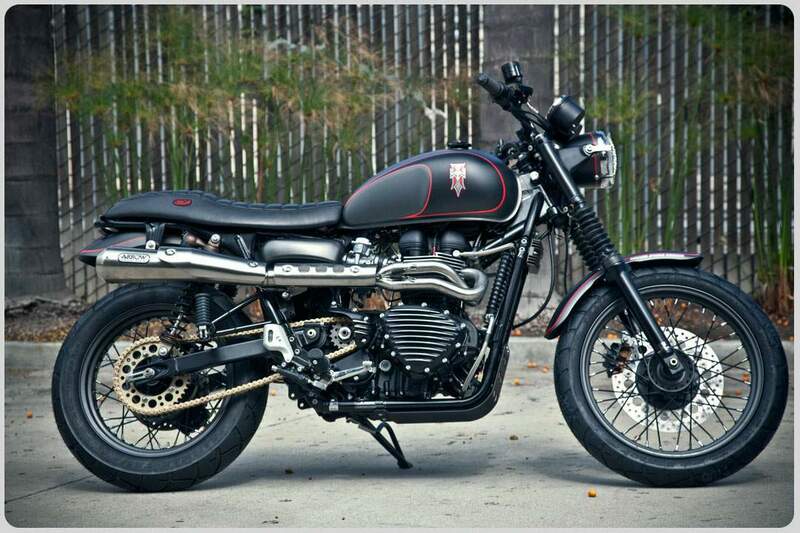 Add classic styling details and it's easy to understand why the Scrambler Tony Hawk Specials of the past were the stuff of Hollywood legends. Triumph's legendary air-cooled 865cc engine delivers plenty of midrange torque. 90% of peak torque is maintained from around 2,500rpm to redline, giving smooth power delivery. 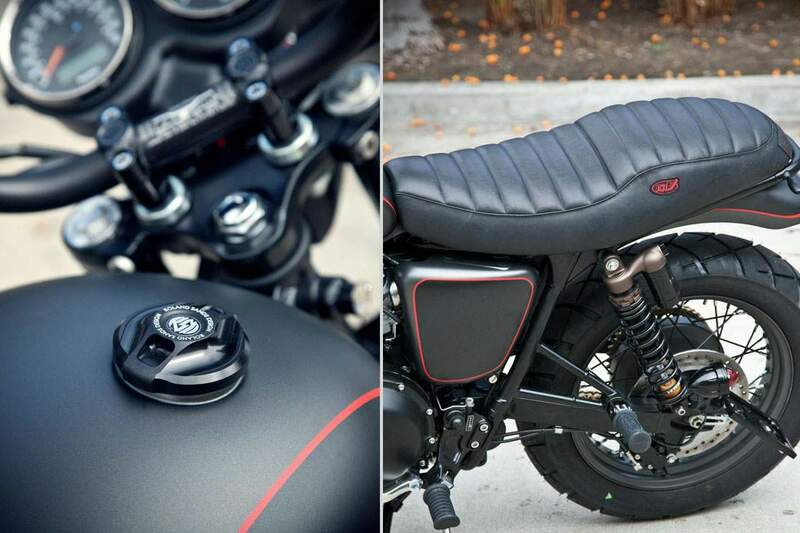 The Scrambler Tony Hawk Special features a fuel injection system compliant to Euro 3 legislation. True to the 60's styling, the fuel injectors are cleverly concealed by throttle bodies designed to look like traditional carbs. High level two-into-one chromed stainless steel exhaust pipe, retro styled silencers and evocative heat shields are key to the Scrambler Tony Hawk Special's unique looks.